An ancient mass grave, uncovered during the construction of a shopping mall outside San Francisco, contains the bodies of seven men who appear to have been victims of “mass homicide” some 1,150 years ago, scientists say. The men — ranging in age from 18 to 40 — bore clear signs of physical trauma, including severe head wounds, broken limbs, and in some cases, the remnants of stone and obsidian weapons still among their remains. Now, chemical analysis has revealed that the men were far from home when they were killed, up to several days’ journey from where they were born and raised. The discovery is only the most recent example of violence among prehistoric hunter-gatherers in the region, anthropologists say. But it bears important lessons about the nature of conflict and warfare in pre-contact California. 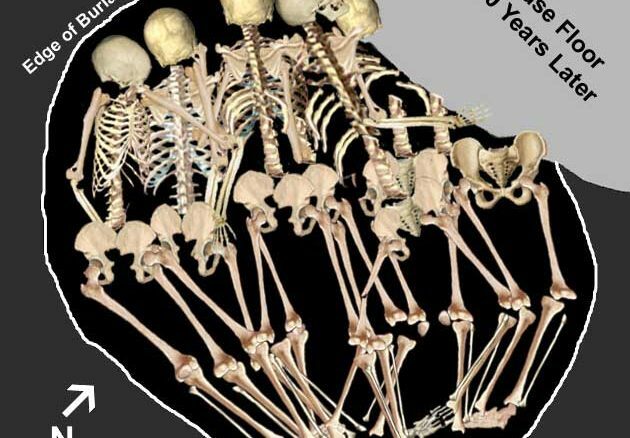 “I think people deserve to have their stories told, especially those that did not write it down, and sometimes they have lessons to teach us also,” said Dr. Jelmer Eerkens, a physical anthropologist at the University of California, Davis, who studied the remains. The grave was unearthed in 2012 during the construction of a shopping center in the town of Pleasanton, in the Amador Valley just east of Oakland. 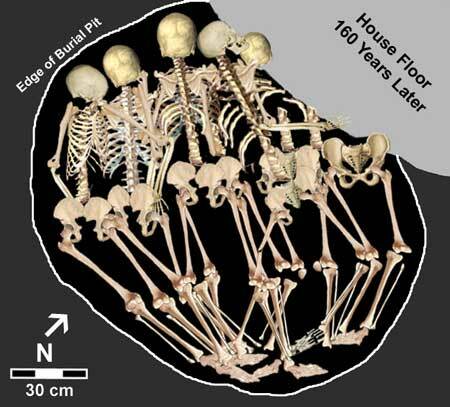 A salvage excavation was ordered at the work site — where more than 200 other burials were eventually found — but it soon became apparent that this grave, labeled Burial 85, held a grisly story. “The excavators noted that the burial was unusual,” Eerkens said. “Seven men in their prime, buried extended and on top of one another — it looked like they were hastily buried. With the permission of the landowner and members of the local Ohlone community — the living descendants of the victims — Eerkens and a team of colleagues undertook a study of their remains to learn more about them. Their skeletons told part of the story. One of the men suffered a severe blow above the left eye, causing fractures that radiated through the side of his skull. Another took a blow above the right eye, and a flake of obsidian was found by his pelvis. All of the remains returned the same radiocarbon range, dating to around the year 850 CE. But Eerkens and his team wanted to go deeper into the men’s lives, to determine who they were, and where they came from. Because, as Eerkens pointed out, the men lived during a pivotal time in central California’s prehistory. During the 9th century, he explained, the area around the village where the bodies were found — from the Sacramento River valley to the north, to the San Joaquin valley to the south — had some of the highest population densities in the region. As a result, archaeological evidence has shown that many people were on the move around this time. As some communities reached critical mass, smaller groups began lighting out, seeking new territory to settle. “Such resettlement may have brought them into conflict with groups that were already living there,” Eerkens said. In order to see how, or whether, the men in the mass grave figured into this tumultuous time, the researchers had to learn more about them. “We wanted to reconstruct different aspects of their life history,” he said. So they began by turning their attention to the victims’ teeth. Human teeth — and to some extent, bones — contain chemical traces of the food we eat and water we drink throughout our lives. The amounts of carbon and nitrogen, for example, can reveal clues about a person’s diet — like whether he lived mostly on plants, fish, or meat. Meanwhile, water contains unique ratios of oxygen and strontium isotopes, depending on the local geology. So, analysis of teeth can reveal where a person was born and raised while their teeth were forming, based on the isotopes of oxygen and strontium they contain. And levels of carbon and nitrogen can provide insights into what they ate, and by extension what kind of environment they lived in, throughout their lives. By studying bone and teeth samples from each of the victims, Eerkens’ team discovered that the men’s tissues were all chemically similar to each other, as if they had spent their entire lives together — but they were also clearly different from ones tested from the rest of the burials in the village. “In this case, all of the isotopic signals are congruent in telling us the men were not from the Amador Valley, and had very different diets than people living in the Amador Valley,” Eerkens said. In particular, the men’s nitrogen levels indicated that they lived further inland, near a river, where they ate freshwater fish — and not in a coastal area, like the San Francisco Bay, where marine animals would have dominated the diet. Similarly, oxygen and strontium levels indicated that the men weren’t originally from the Bay Area. Instead their chemical signatures turned out to match those from a different geologic region to the southeast. “The different isotopes, together, allow us to hone in on a homeland,” Eerkens said. The one place that fit all of the chemical clues, he said, is the San Joaquin Valley, southeast of where the men were buried. Having established where these seven murder victims were from, the researchers then investigated another key piece of their life stories: whether they were related to one another. The genetic relationships among the men might illuminate how people — or at least, single men — traveled and engaged in conflict in 9th century California. Did men raid villages as bands of brothers or cousins, for example? Or were they from the same community, but different households? To address this question, Eerkens and his colleagues studied the men’s teeth and bone tissues to isolate their mitochondrial DNA — the genetic information that’s passed only from mothers to their children. This could tell the researchers whether any of men shared the same maternal lineage. Among pre-contact Native Americans, Eerkens noted, there are 5 major groups that can be identified by mitochondrial DNA, called haplogroups. And each of these groups includes dozens of more specific haplotypes, which can in turn be traced to separate sets of maternal lineages. And the results showed that the seven men in Burial 85 represented at least four different haplotypes. “Meaning the men who were engaging together in warfare or conflict could not all be brothers or maternal cousins,” Eerkens said. This, too, provides important insights into how violence may have occurred among ancient Californians, he added. “This suggests to us that warfare or raiding was conducted by people who lived in the same or nearby villages, but who were drawn from different households and families. Eerkens points out that generalizations can’t safely be drawn from the lives of just seven people. But for now, it’s the men’s violent end that is the focus of researchers’ attention — not because it is exceptional, but because it isn’t. “The data tell us that violence was prevalent among the hunter-gatherers of ancient California,” Eerkens said. “To an anthropologist, this is not surprising: All human societies experience conflict and violence. Graves like Burial 85 are reminders of the dramatic transitions that were taking place in the coastal West in the 800s, he noted, and that a common product of such change has often been conflict. “Just because they made warfare, doesn’t detract from them,” Eerkens said. Eerkens and his colleagues report their findings in the American Journal of Physical Anthropology. While I appreciate the article in general, how would a tribe survive without considering the best of them at warfare that might not be direct family and secondly, why would warfare detract from them?“Just because they made warfare, doesn’t detract from them,” Seriously, how would it? That is how humans have always been and probably will be, if there are not enough resources. While he is defending them, it is abhorrent to me that he needs to do so. Maybe because Eerkens and his ilk lives in a time of plenty of the modern west and can consider such from a pretentiously morally superior standpoint. Where if he lived in any time before the modern zeitgeist of hippy liberalism, he would not even need to defend the violence that is part of human survival and the necessity of gaining resources to avoid starvation and obliteration of ones people. Monad, you missed the point entirely. What Eerkens says is that the common, PUBLIC view of the prehistoric past, prior to the arrival of Europeans, is as an idyllic land of plenty. IN FACT, archaeologists in California have very extensive experience with the skeletal remains of victims of war and execution. That is what Eerkens is saying, but the public and the descendants of the dead do not want to hear about the reality. In fact, as part of hos those burials are finally disposed of, the very weapons that killed them will be classed as “grave goods” and reinterred with the burials. The modern analog would be taking the knife that killed a stabbing victim and insisting that it be placed in the grave with the body. As Eerkens points out, the past was really not like that. In fact, it was very much like the present, occupied by human beings with human motives. Monad is dead right, and that is exactly what the Author of the study was getting at. Also, I don’t think the descendants of the early Californians ever asked to be classed as “Noble Savages”, and could care less about people finding out their people were not just that. As I could attest, they don’t give two sqats what you people think. JW. Since they are now long dead, that would be “… could have cared less…” You’re right, the prehistoric peoples were who they were. The difficulty modern archaeologists run into is the popular but unreal notion that somehow the distant past a golden age of peace. It wasn’t, ever. The only common factor seems to be that the more populous a period the more common violence was, and the more culturally transitional a period was the more violent it was. The period about 1,100 years ago in California was a period of large changes. Populations were growing quickly. New technology like the bow was appearing. There were movements of populations that we will probably never unravel, but they resulted in thousands of deaths by violence. The comparable period was historic contact, possibly for the same reasons. Yes, I agree. California was very crowded in the prehistoric and protohistoric era. It was the most crowded and the different triblets were jostling for territory. I think in this particular case this was a war party, that came for a surprise attack and got caught and murdered. The local tribe was probably defending there lives, families and territory.